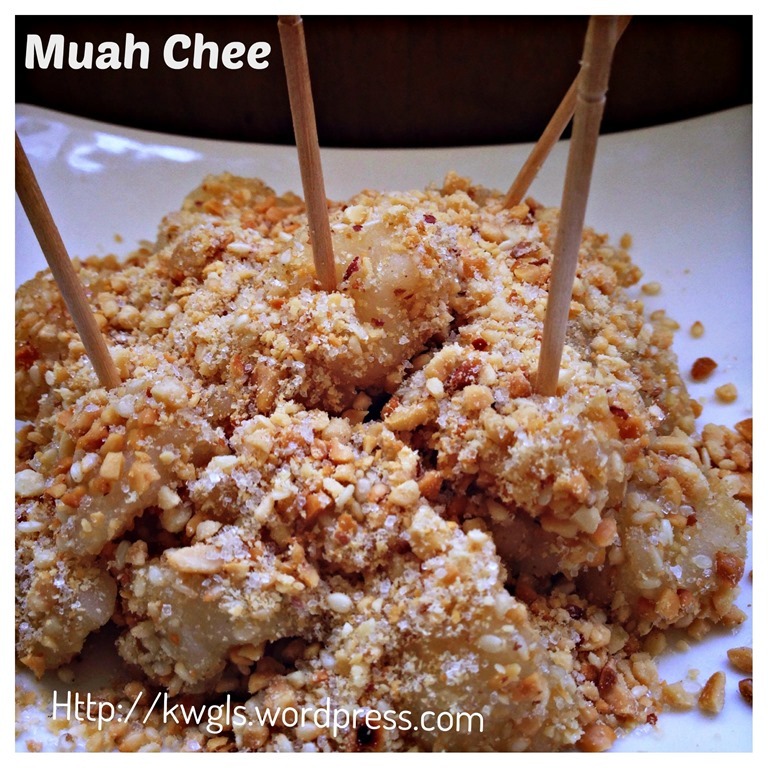 Muah Chee is basically a type of cooked sticky rice dough coated with sugar, grounded peanuts and sesame seeds. It is believed to be originated from Southern China and can be easily found in Singapore and Malaysia stores selling snacks. Traditionally, the sticky rice are steamed for 20-30 minutes (depending on the size of the dough) and become a white coloured sticky dough. 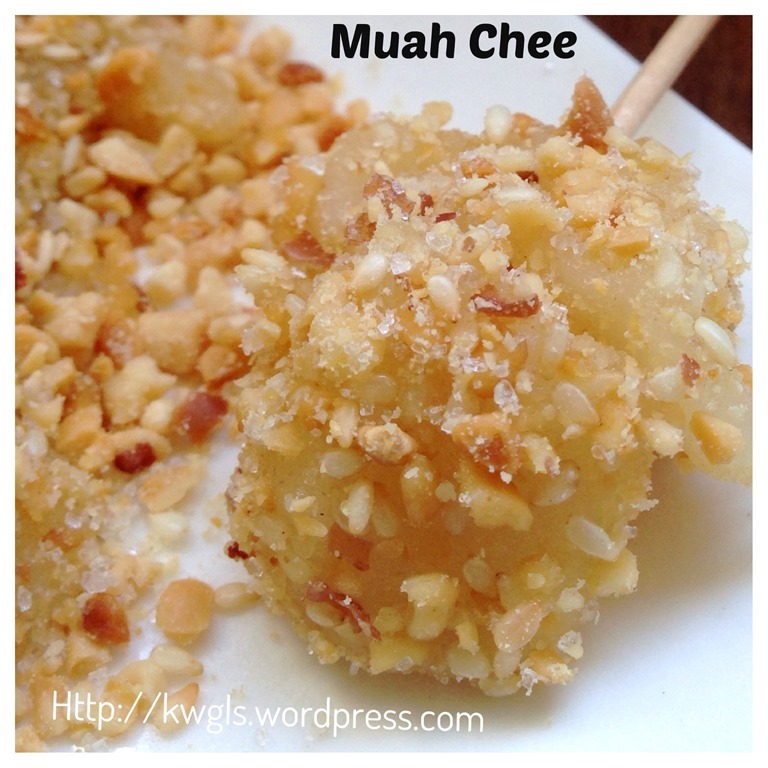 This dough is then cut into bite size pieces and generously coated with a mixture of sugar, peanuts and sesame seeds served using a toothpick. As it is a vegetarian food, it is therefore commonly serve during Chinese religious activities in the temple. This is a simple recipe of my own and all this while, I know that microwave can be used in the preparation of this traditional snack. 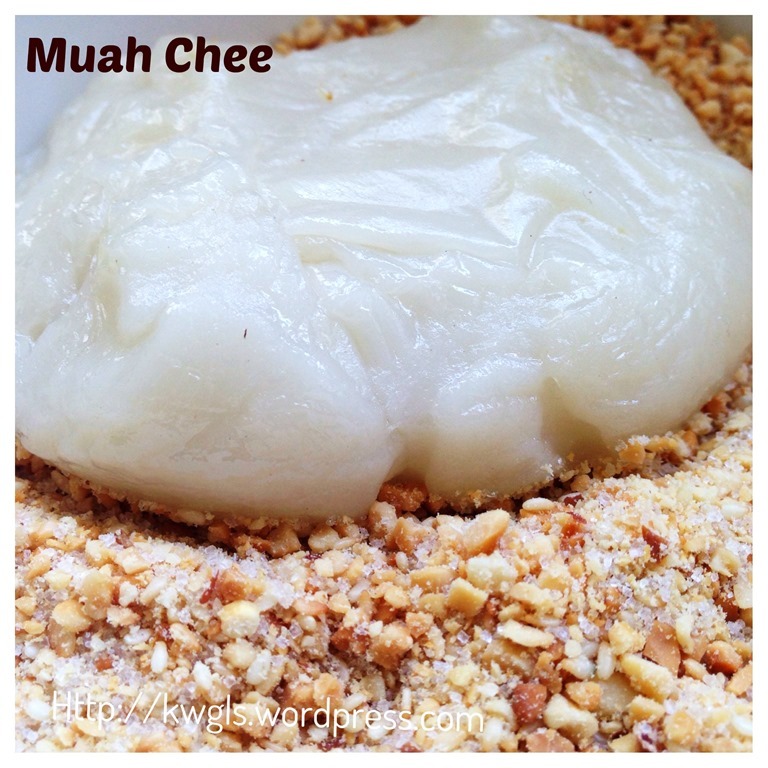 This short cut method have saved lots of time of preparation rather than steaming the glutinous rice cake or muah chee （花生芝麻糍粑）。 I have been using microwave in the preparation of some peanut mochi and have shared my recipe in my Facebook Page here. 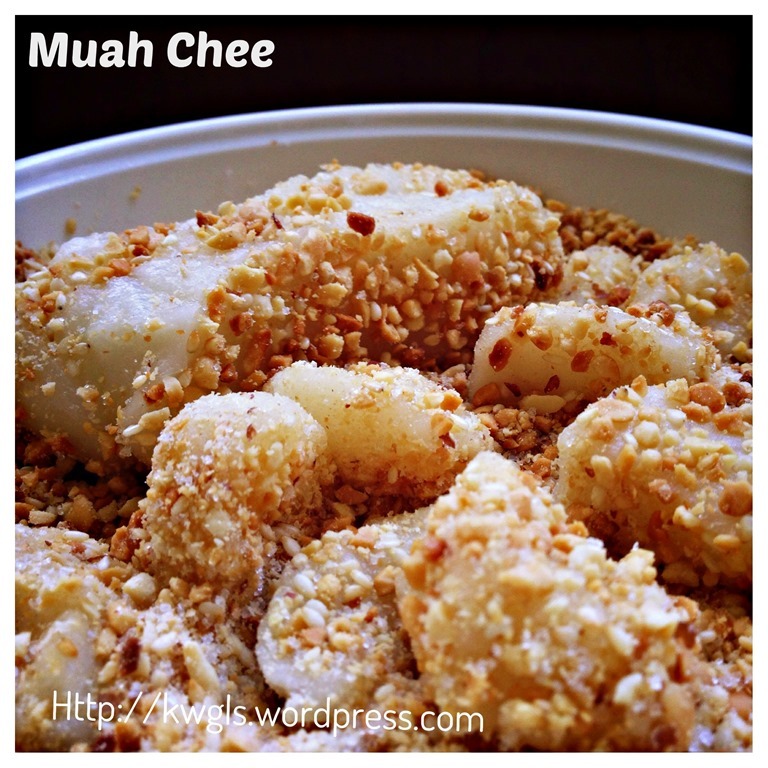 Since I am going to dispose half a package of the glutinous rice flour sitting ideally in my kitchen shelf, I have decided to prepare some muah chee as the snack for the family members. 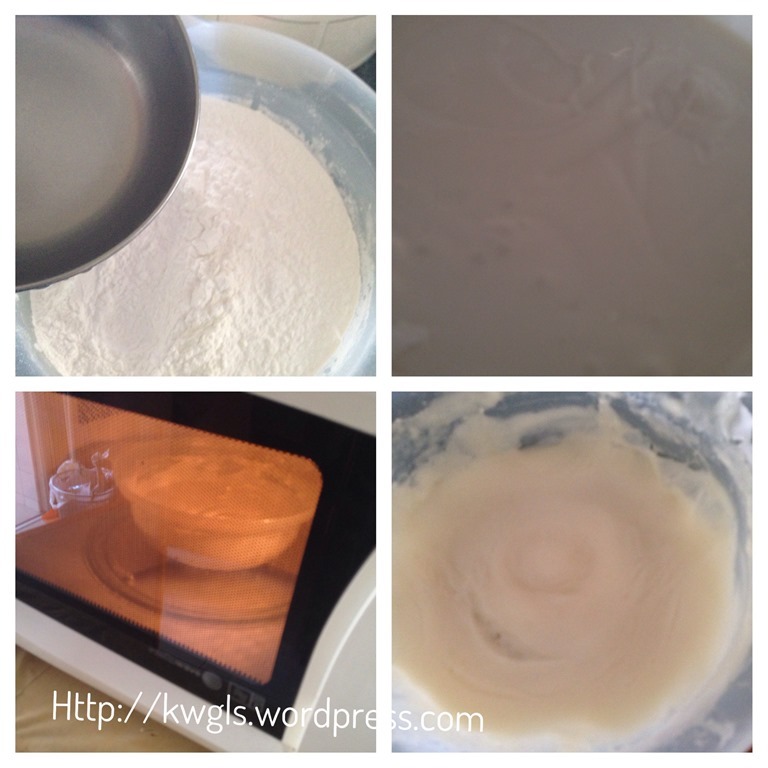 Mix the water, tapioca flour and glutinous rice flour in a microwavable bowl. Stir until well mix. Heat in the microwave for 3 minutes. It will form a stick dough. 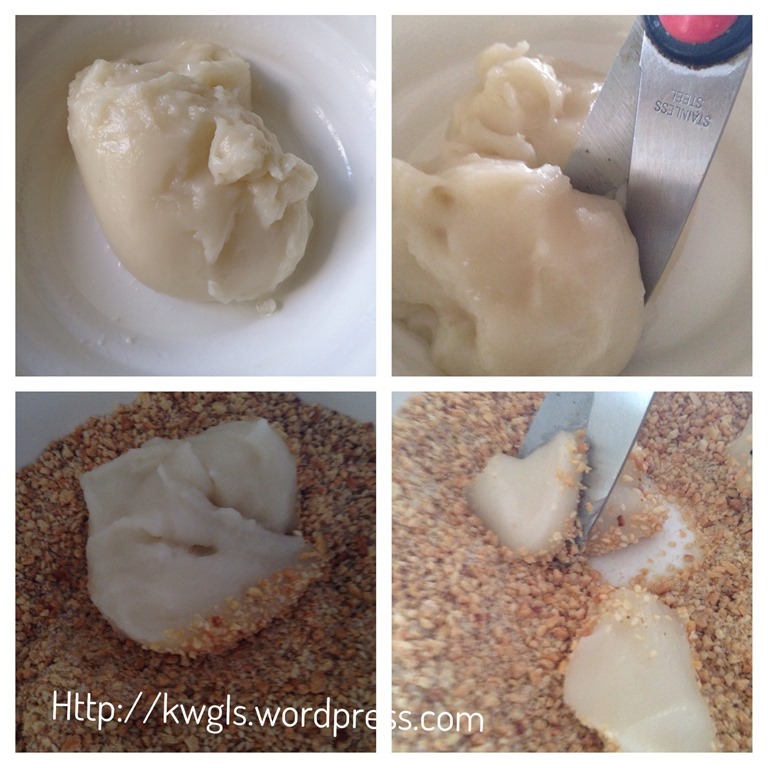 In a bowl, put the grounded peanut and sesame seeds together. Stir until well mix. Place the glutinous rice dough on top of the grounded peanut. Use a scissors to cut the dough into your desired size. 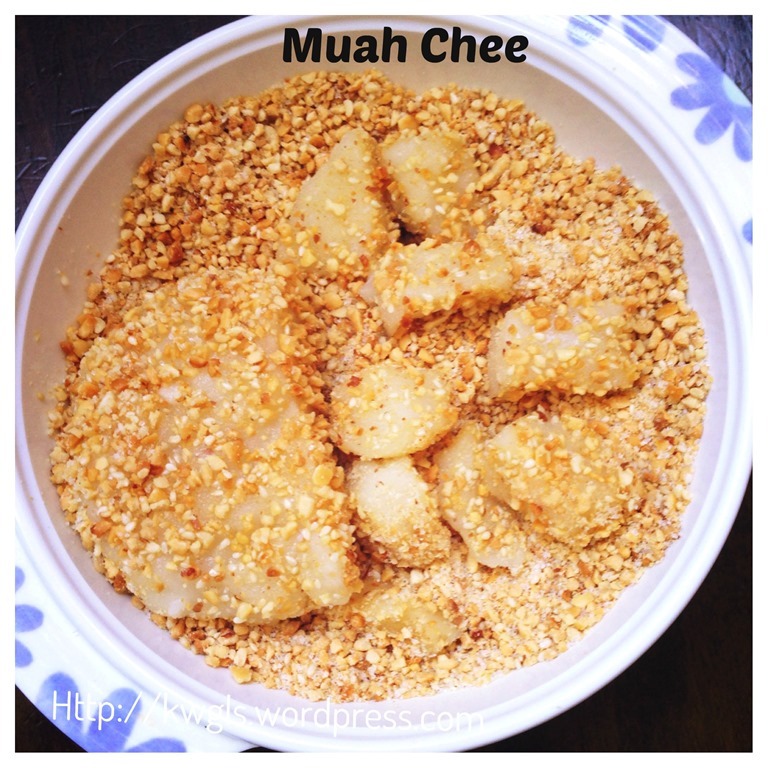 Dust or coat sparingly the cut muah chee with the ground peanuts and sesame seeds. Usually served as a tea time snack. 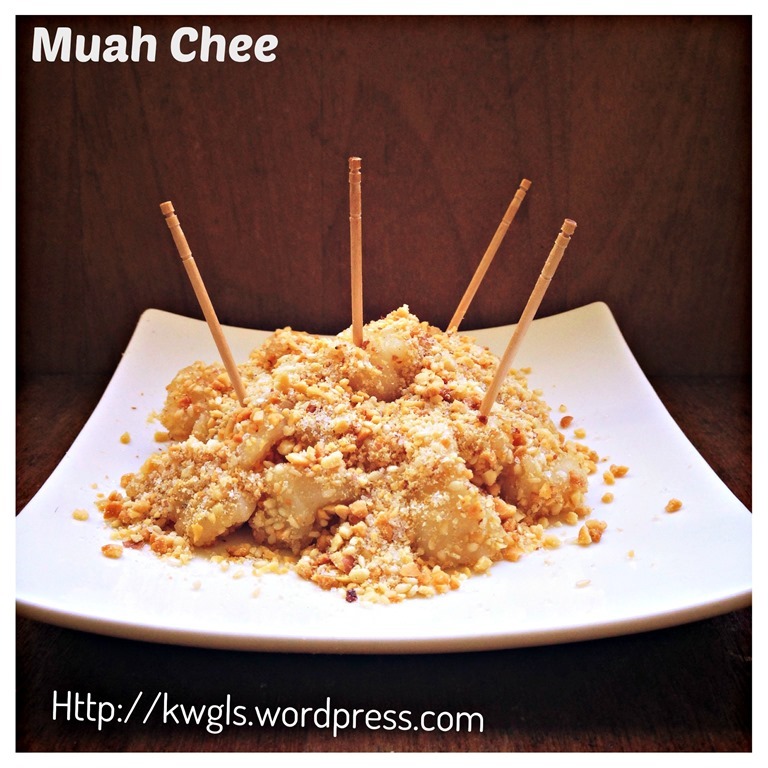 Nothing to shout about, nothing much to write about and I hope you can give this simple snack a try. 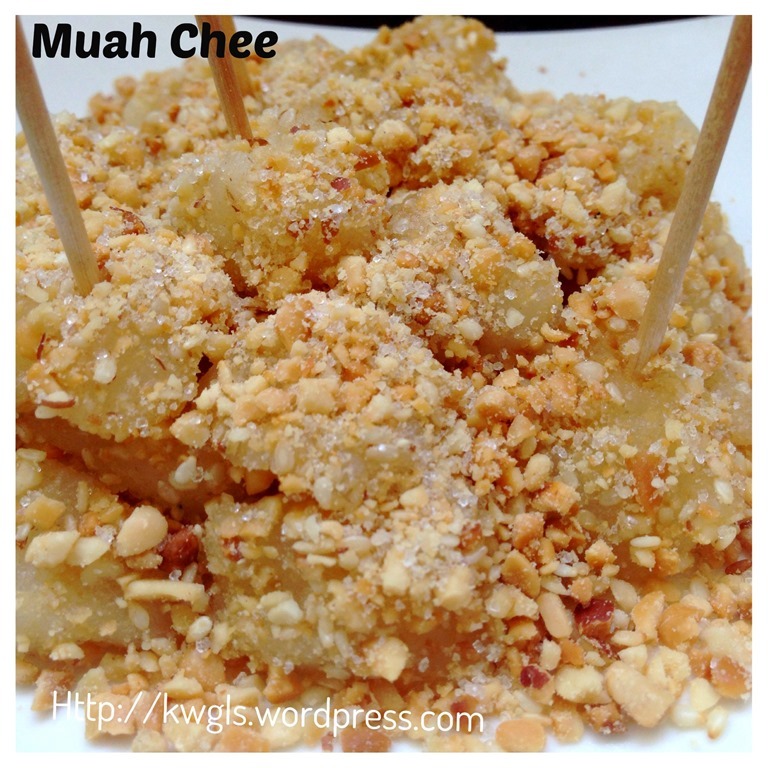 This entry was posted in Chinese and Asian Cakes and Snacks, Food Preparation Series and tagged 8, 花生芝麻糍粑, 麻糍, GUAI SHU SHU, Guaishushu, kenneth goh, Mochi, Muar Chee, peanut mochi, postaday. Bookmark the permalink. This sort of looks like mochi with the addition of it being coated on the outside. I’ll have to give this a try. 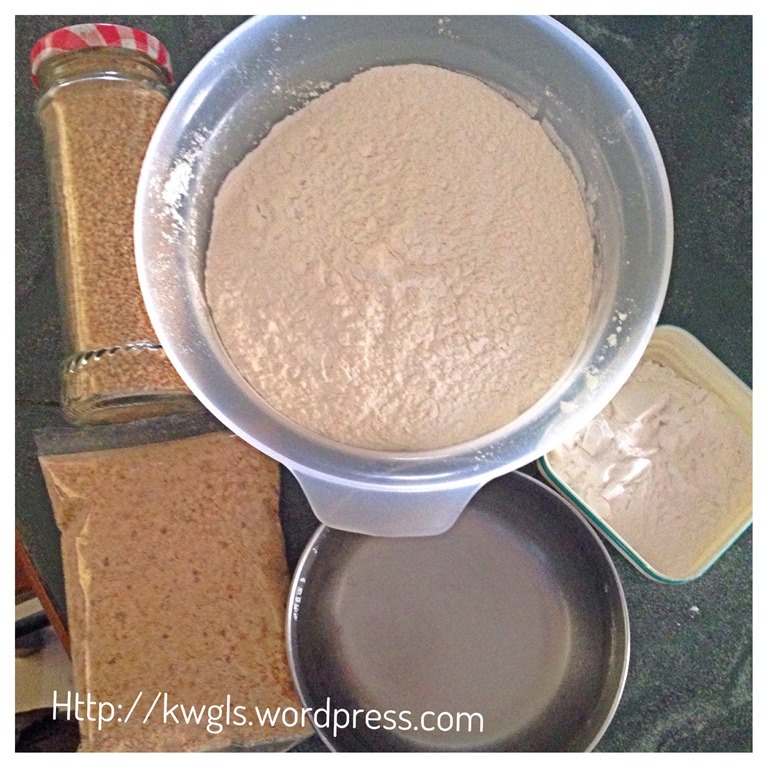 Your recipe is easy peasy… tried it & my family loves it. My daughter said that she bought this fron shop that sells RM3 per small serving. I topped with some black sesame seeds for flavouring. Yeah, easy recipe n yummy. My family all of them love it. Use to buy fm pasar malam RM3 quantity very small, tak puas makan. Now hv no worries, anytime can make & enjoy with family. Thks Kenneth. 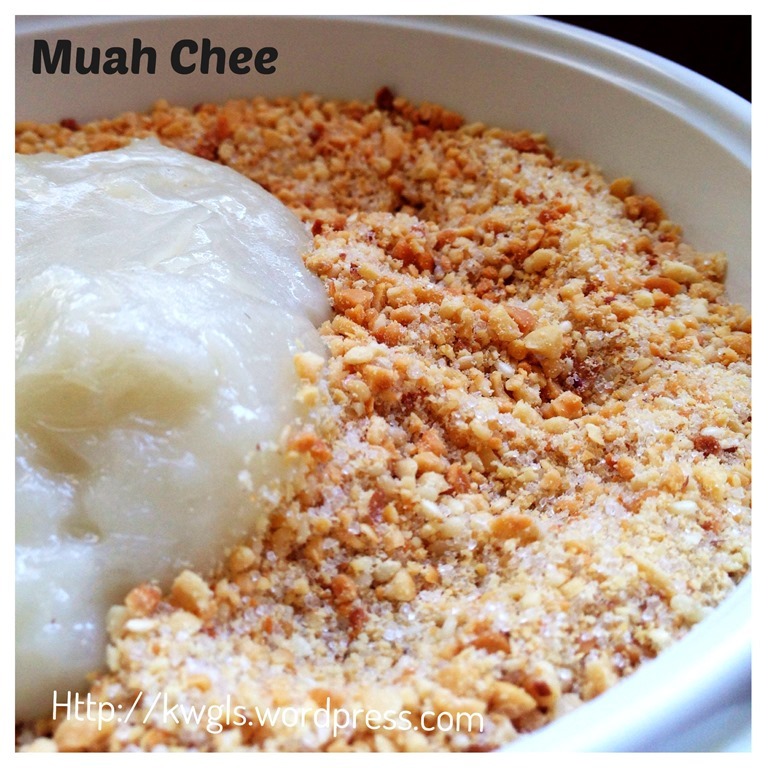 I’m going to try making muah chee . When microwave the batter in microwaveable bowl , need to cover the bowl? Thanks Kenneth. 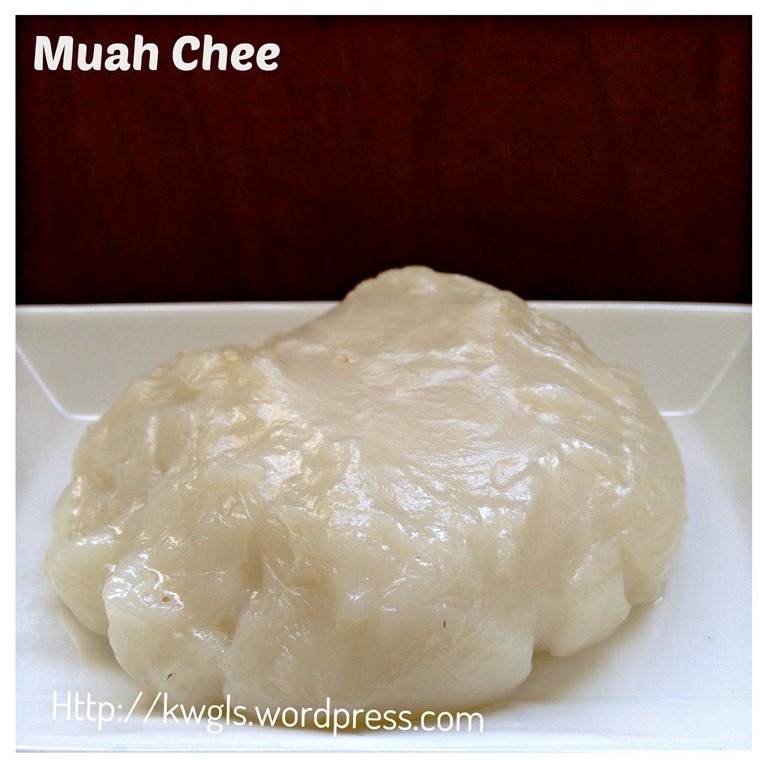 Hi Sifu Kenneth, can I cook on stove top the glutinous rice flour mix with water? I don’t have microwave ler…thanks!